Green tea is popular worldwide for its health benefits and it is packed with antioxidants that fight free radicals, disrupt the production of bacteria and produce cancer-fighting flavonoids. The Department of Dermatology at the Seoul National University College of Medicine reports that green tea may also stimulate hair growth. Please note that green tea and green tea extract have not been evaluated by the Food and Drug Administration and are not considered a cure or treatment for any condition or disease. If you are experiencing an excessive amount of hair loss or particularly slow rate of hair growth, please consult your physician. According to the U.S. National Library of Medicine, a 2007 study by Korean scientists at the Seoul National University College of Medicine found that epigallocatechin-3-gallat, or EGCG, present in green tea promoted growth of hair follicles and stimulated the human dermal papilla cells to boost hair production. According to the University of Maryland Medical Center, green tea can increase your metabolism. A faster metabolism may increase your hair growth rate. 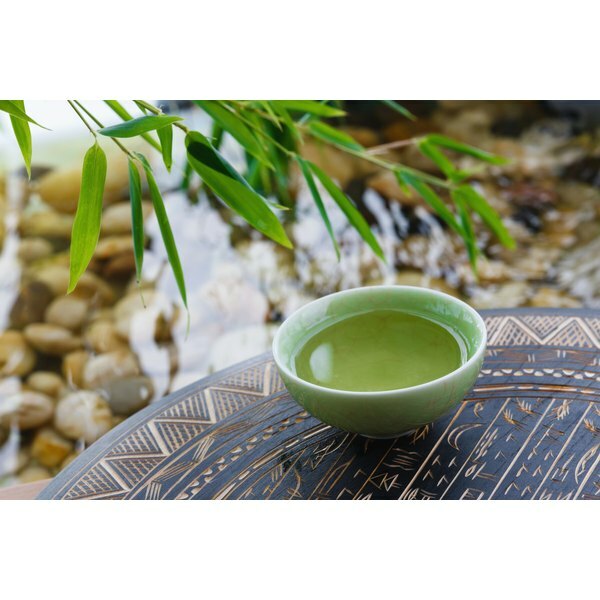 While green tea may stimulate your hair follicles and make your hair grow faster, it is not necessarily useful for treating androgenic alopecia, which is a genetic hormonal hair loss condition. The Korean study notes that green tea may have potential to inhibit 5-alpha-reductase, the scalp pathway that converts testosterone to DHT and leads to hair loss. The University of Maryland Medical Center reports that green tea contains a high concentration of potent antioxidants known as polyphenols. Antioxidants protect the cells from being damaged by free radicals and are also known slow the aging process. Antioxidants can help keep your hair healthier and growing at an optimal rate. A study conducted on mice that experienced a spontaneous loss of hair by the Department of Otolaryngology at Charles R. Drew University of Medicine and Science demonstrated that green tea may potentially help to regrow hair. Many shampoos formulated to stop hair loss have added "green tea extract" as an ingredient to help combat alopecia. According to hair restoration physician and member of the American Hair Loss Association Dr. William Rassman, no clinical scientific studies confirm that green tea is effective for reducing pattern hair loss. The Medical College at Georgia reports that green tea holds potential for treatment of dandruff and excess scalp flaking. Green tea is believed to exfoliate the dry flakes that are formed as a result of dandruff. Dandruff is a very common scalp condition and although further research still needs to be conducted, green tea may be effective for treating dandruff. Chris Deoudes has been a fitness writer since 2006, with articles published at Bodybuilding.com and Avant Labs. He is certified as a personal trainer by the American Council on Exercise and as a performance sport nutrition specialist by the International Sports Sciences Association. He has a Bachelor of Arts in criminal justice and business management from the University of Florida.